Garage Equipment’s huge range of superior garage floor jacks won’t let you down. Each of our impressive garage floor jacks has been carefully designed to suit a particular lifting application. They can easily lift virtually anything you need raised in your workshop or garage. With capacities ranging from 900kg to 25 tonnes, we have a floor jack to suit any application. 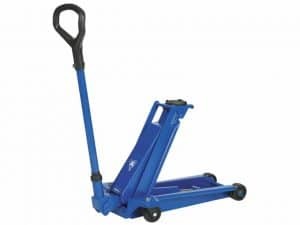 Whether you need an “all-rounder” for day-to-day jacking, a quick-pump garage floor jack, a low-profile garage floor jack, or a super heavy-duty jack, Garage Equipment have the solutions you need. 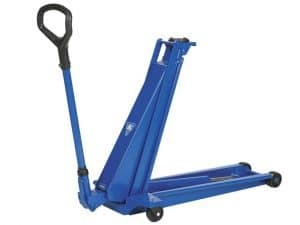 And if your workshop needs lifting capacity above and beyond these incredibly well-engineered jacks, we can supply you with a truck lift or car lift. Browse the Garage Equipment range of quality floor jacks now and discover your ideal workshop solution today. And for more information, simply fill out the contact form or call us on 1300 777 318.